Nike Patents Self-Lacing Shoes From 'Back To The Future' | OhGizmo! Great Scott! Self-Lacing Shoes Are Real! As I Predicted, That New Magnetic iPad Smart Cover Is Already Changing The World – Behold Magnetic Baby Clothes! We’ve written about the shoes from Back to the Future II on more than one occasion. Mostly because it’s one of the few “futuristic” technologies that might have a chance of being made by 2015. A little while back we showed you a custom shoe that was made using an Arduino board. It was cool, but not exactly practical for wearing. So who do we look to for a real pair of these self-lacing shoes? Nike. The patent goes on to describe the means by which the footwear will be powered. It seems that they’ve chosen to use a pair on induction chargers with a docking station to recharge them. It makes sense, as you’ll probably be putting them back in the same spot every night. So who wants to take bets on whether they actually get these puppies out in the next five years? 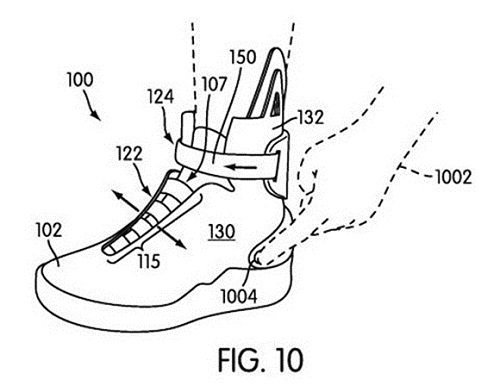 What's next for Nike, patenting a time machine? I guess the movie is not considered as prior art with the USPTO. I visited Nike HQ in 2001 looking to partner with them on some applications for technology. I know they were interested in energy harvesting. Using the action of walking to generate and store electricity. I wouldn't trust such a footwear though. What if for some reason the batteries fail e.g. short circuit, the electronics fails to leave a reserve charge for unlacing or just plain explode/burn. What if the the lacing mechanism jams or simply breaks? And how about the horrendous amount of pollution this will create. The manufacturing will require a lot more bits and pieces plus shoes are already a highly disposable item.